As the 2012 awards season draws to a close, there have been multiple wins for Indigenus agencies at three of this year's foremost events: The Global Healthcare Awards, CLIOs and The Rx Club. 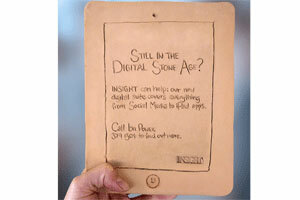 On December 6, Insight NZ was named the Direct Mail category winner at The Global Healthcare Awards with their self-promotion activity, the Clay Tablet iPad. Five Indigenus agencies – Insight AU, Insight NZ, PharMa International, Serviceplan Health & Life and The CementBloc – were named finalists. Back in May 2012, it was a Gold CLIO for Serviceplan Health & Life for their digital entry, Repay for Good, and the agency was shortlisted in the Design category for a calendar they developed for AOK Health Insurance. W&V, the German trade title for marketing and communications recently ranked the Serviceplan Group as the most creative agency in Germany. The CementBloc took home multiple honors at this year's Rx Club Awards which were announced in November, including Gold for the Grow Sole integrated campaign, a collaboration with the COORE Foundation encouraging people to donate their gently worn shoes for children in developing countries. Sorrento Healthcare was awarded Gold for their poster Eternal Bonds, designed for Abbott Healthcare. CPC Healthcare Communications, Insight AU, and PharMa International were also recognised by the Rx Club with Awards of Excellence. "Collectively, these honours speak to the truly global reach of the Indigenus network. Independently, they recognise the creative strength demonstrated by the agencies that comprise it," said Rico Viray, Indigenus chairman and founding partner at The CementBloc. “A win for any of our agencies is a win for the network as a whole, and we celebrate each other's success as our own,” Viray added.